"A quick recipe I thought up while trying to decide what to eat for breakfast. 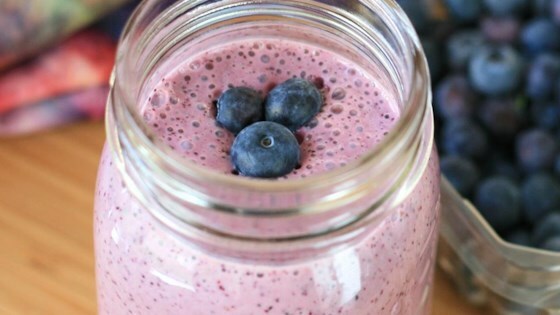 Great if you are trying to figure out what to do with those blueberries in the fridge or freezer! Also great on-the-go! Delicious and includes many foods that are a great way to start your day! Many of the ingredients, except for the blueberries and yogurt, are optional and vary depending on your own taste. I love cinnamon and a thick, super-cold smoothie. This recipe is super versatile, and you can change it depending on dietary needs or personal preference. Have fun with it!" Blend blueberries, yogurt, orange juice, sugar, vanilla extract, and cinnamon together in a blender on low speed for 30 seconds; increase speed to high and blend until smooth, about 2 minutes. Add ice and blend on high until smooth, about 1 minute more. If you want it sweeter, try adding more orange juice first. If that doesn't do it, add another tablespoon of sugar or sweetener. If you don't like vanilla, don't add it! It was very tarty and I don’t like that but if you do follow the recipe exactly. If you like it sweet and fruity add more sugar and a few more blueberrys. VERY good! I had sugar free cranberry juice so I used that in stead of OJ. Used plain yogurt and substituted Sweet N Low for the sugar. Great low cal., low carb snack!